Stump the Priest: How Much is Too Much? Question: "In this world where we are taught to enjoy ourselves and seek pleasure, where, even as Christians, we want to glorify God's creation, how are we to know when we have reached a level of overly enjoying the pleasures of the earth or of God's creation? I mean to say, if we are relaxing on the beach, or walking in wood, or gazing at the heavens, how do we know when enough is enough? It seems obvious we could or should all be working continuously for the Lord by praying or doing good works. But then it seems almost sinful to not enjoy the beauties of the world and God's creation as well. Is there a formula mentioned or something to help us know when enough is enough?" There is not a simple formula. When you learn how to ride a bike, you have to learn how to balance your weight on the bike, while you peddle, but how do you do that? You do that by trying to do it, and when you fall down, you get back on the bike, and try it again. There are some things that are inherently evil, and so there is no question but that we should abstain from such things. But it is not a sin to enjoy a good meal, or enjoy the company of another person. These are good things, but most good things can be taken to excess, and then it can become sinful.. but the sin is in the excess, not in the thing itself. It can be an even better thing to abstain from such pleasures, if you are doing so out of love for God and a desire to draw closer to Him and to remove things that distract from that desire. But even asceticism can become sinful if it is seen as an end in itself or used as a means to vainglory. So marriage is good. Eating meat is good. Drinking wine is good. However, if you abstain from these out of true asceticism, that is also good. But if you view these things as sinful in and of themselves, this view is itself sinful, and if not repented of will separate you from the Church. So the key here is to find a balance. And what the right balance is will be different for different people. In order to find that balance, you need to inform your conscience by regularly studying the Scriptures, the writings of the saints, and other edifying books. You need to keep the fasts of the Church. You should also pray that God will guide you, and go to confession regularly. And remember the words of St. Poemen the Great: "Everything that goes to excess comes from the demons" (Saying 129 of St. Poemen, from the Alphabetical Collection of the Sayings of the Desert Fathers). You can listen to a sermon on some of the sayings of St. Poemen the Great which relate to this question, by clicking here. But aside from the usual She-devil distributing communion, or the occasional priest wearing a Barney suit, if you just listen to the music, what you are hearing is run of the mill Charismatic "praise and worship" music. Here we have music that could have been from the "Lion King", followed by a Charismatic "praise and worship" song that could have been sung in any non-denominational Protestant Church in the United States. The only parts of the service that are not completely Protestant are the pagan elements of dancers carrying bowls of incense, who are dancing around the holy table. Nevertheless, we are still told that this was just an aberration. This is from Pope Francis' recent trip to Brazil. 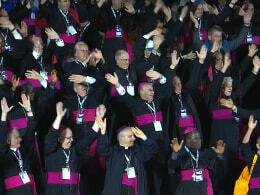 Granted, this is not a liturgical dance, but here you have a whole group of Bishops engaged in a tacky dance to celebrate the Pope's visit. Trying to be "hip" and holding fast to the Traditions of the Church do not mix well... and usually those that have tried to make the sacred "hip" have only succeeded in making themselves look foolish, and encouraging the mockery of the sacred. The idea of "Children's Church" is another bad idea imported from Protestantism. What was "Children's Church" in the 70's and 80's, is what is now adult Church in most Protestant Churches. The idea of separating children out from the rest of the Church, and having worship that caters to them has no basis in the Tradition of the Church, and inevitably leads to a dumbing down of the services. Prior to Vatican II, even the worst critics of Rome would have agreed that their services were solemn. Whatever else you might have said, there was an undeniable dignity and reverence to their services. There is not much dignity or reverence in any of the aforementioned. The first step in fixing a problem is acknowledging that you have one. Rome, you have a problem. Stump the Priest: Where do the Races Come From? Question: "Where did all the other races come from? If God created heaven and earth, did he also create the different languages and different colors of skin? If so, what was the reason he created all of us different?" The concept of race actually does not appear in the Bible. In Scripture, people are categorized as belonging to groups according to their family, tribe, people, nation, and tongue. 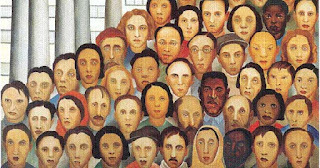 There are three broad racial categories that we recognize today: Negroid, Mongoloid, Caucasoid -- and so some suggest a connection between these and Noah's three sons, Ham, Shem, and Japeth, but there is no way to prove or disprove that. National and linguistic divisions, according to Scripture, began with the Tower of Babel, where God divided the nations by creating differences in language (Genesis 11), and so by dividing the nations God set limits on the ability of evil to spread among from one nation to another. It should be pointed out that contrary to the beliefs of people prior to the discovery of blood types, all races have all the same blood types. Those features that we consider racial are truly superficial, and the Church does not consider them to be worthy of note. In Numbers 12 we have an incident that we would think of as racial today, but which was more a question of ethnicity and culture, in which Moses' brother and sister complained about his Ethiopian wife, and it should be noted that God made it clear that it was not Moses who had erred in marrying the Ethiopian, but his siblings in speaking against him on account of it. See "Moses' Black Wife" for more on that incident. The Jews, of course made a sharp distinction between themselves and the gentiles (nations), but this was not ultimately racial, because it was possible for a gentile to convert to Judaism. But the New Testament repeatedly makes the point that "in Christ there is neither Jew nor Greek," but rather we "are all one in Christ Jesus" (Galatians 3:28; Colossians 3:11). St. Peter, after witnessing the Holy Spirit coming upon Cornelius, said: "In truth I perceive that God shows no partiality. But in every nation whoever fears Him and works righteousness is accepted by Him" (Acts 10:34-35). The Church Fathers and the Services of the Church, speak of only two races: the race of man (Adam), and the Christian race, and the only mixed marriages we speak of are when an Orthodox Christian marries a heterodox Christian. "Once, when He descended and confounded the tongues, the Most High divided the nations; and when He divided the tongues of fire, He called all men into unity; and with one accord we glorify the All-Holy Spirit." And so while we belong to a particular family, tribe, and nation, and speak different languages, and while we have our racial, and cultural differences -- as Christians we are all one family, and one nation. We are Orthodox Christians first and foremost, and any other difference we may have is only superficial. Why did he make us with different colors of skin, hair, and eyes? Probably for the same reason that Jacob made Joseph a coat of many colors... such variety makes for more beauty. This is a gift from God to humanity. 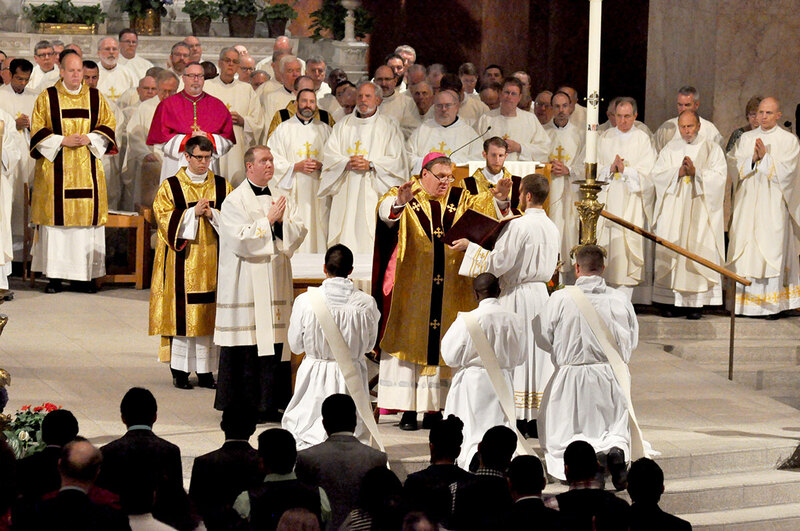 Stump the Priest: Mass Ordinations? Question: "Why did our bishops declare the ordinations of a group of Western Rite clergy invalid because they were ordained in a single service? Why was this such a big deal?" There are several reasons. To begin with, every clergyman in the Russian Church, before he is ordained, takes an oath before the Gospel and the Cross, saying that they will “…perform all liturgical services or prayers according to the rules of the Church….” This means that we cannot just make up services, or introduce innovations into the services, but must do the services as approved by the Church and in conformity with its Tradition. They also “promise to be obedient to the ecclesiastical authorities and act according to the Canons of the Holy Apostles, of the Ecumenical and Local Councils and the teachings of the Holy Fathers.” And so not even a Bishop may introduce liturgical innovations into the services of the Church that are contrary to Church Tradition, and not sanctioned by the Church that they belong to. The argument in favor of doing a mass ordination in the Western Rite is that this was the practice in the pre-schism West. The problem with this argument is the assumption that anything that was done in the pre-schism West is therefore acceptable. In Orthodox Liturgics, we partake of only one loaf for communion… and so no matter how large the congregation, a loaf of sufficient size must be used to be consecrated for the Eucharist (1 Corinthians 10:16-17). In Western practice, the priest partakes of one wafer, but the people all partake of different wafers. In Orthodox Liturgics, a clergyman may only serve one liturgy in a day, and only one liturgy may be served on a given altar. In the west, a priest may celebrate as many Masses as he has the time and strength to perform, and he can do so on the same altar. Likewise, in the West, numerous priest, deacons, and bishops can be ordained at one time, but in Orthodox practice, only one Bishop, one Priest, and one Deacon can be ordained at the same liturgy, because each one represents the fullness and unity of that order. In all of these Western deviations, the idea that we all partake of one Eucharist is obscured by the admission of multiplicity. These deviations in the West were already the subject of controversy before the schism, and were criticized by the Eastern Fathers. In the West you also have the practice of a priest serving a private Mass, with no one beside the priest in attendance. In the Orthodox Church, this is forbidden. This is because the focus in the West was on the Mass as a individual act of private devotion, whereas in the Orthodox Church it is a corporate act of communion, which expresses our unity of Faith. What begins as a small deviation in course, over time leads to one getting very far off course from where they should be. And so while many things were done in the West before the schism, we have to look to the practice of the Church that did not depart into heresy and schism for guidance on these matters. “What can be the reason why only two of all the seven Mysteries cannot be performed twice, namely, that of baptism and that of ordination into holy orders? The scholastics, on the one hand, say that it is because these two leave an indelible imprint or stamp which according to them (in the fourth chapter of Theology, as it is to be found in the Catechism by Nicholas Boulgaris) is a real quality inherent in the soul and is a supernatural power. This opinion of the scholastics was followed by almost all our own modern theologians, and especially by Koressios. But to me, on the other hand, it seems that the sole reason why these two mysteries alone are incapable of being celebrated a second time in the life of one and the same individual as a recipient thereof, is because they are carried out in the type, or form, of the Lord’s death, which occurred but once and can never occur a second time. For those who are being baptized are baptized into the Lord’s death, according to St. Paul and Ap. c. XLVII. As for priests who have fallen out of holy orders, the reason why they cannot be ordained a second time is that they typify the first and great priest who came but once to the office of holiness, after finding everlasting redemption, according to St. Paul, and He remains perpetually incapable of fall from holy orders. This in my opinion is the real reason why a priest cannot be reordained. For holy orders in Christ are incapable of fall and cannot be forfeited. Hence His type ought always to stand in the purity demanded and required for holy orders, in order that the likeness may be well preserved, as between the high priest and the one typifying Him. Another reason, however, is also the fact that a priest consists mainly in the exercise of sacerdotal functions, or, more plainly speaking, in sacrificing the mystic sacrament, which is the bloodless sacrifice whereby the one death of the Lord is denounced, according to St. Paul. For it is a question whether there is any good and sufficient reason why these mysteries cannot be celebrated a second time in the nature of the imprint or stamp invented or imagined by the scholastics, because second chrismation is permissible, notwithstanding that the chrism is called a seal, and really does imprint a seal and stamp upon the soul of the one receiving it. For John the Evangelist says: “And the chrism which ye have received from him abideth in you” (I John 2:27). And St. Paul says: “Who hath also sealed us, and hath given us the earnest of the Spirit in our hearts” (II Cor. 1:22). Moreover, one must remember that David even called Saul “anointed of the Lord,” not only after his disregard of God, but also after his death (II Sam. 1:14). Hence and for this reason, namely, the Lord’s unique death, only a single deacon, and only a single presbyter, and only a single bishop or other prelate ought to be ordained at any one liturgy, and not two, or several, according to Symeon of Thessalonica (Reply 39), and also according to Job in the Syntagmation of Chrysanthus. As for those who are not uniquely ordained—i.e., who are not ordained once for all—what they are I know not, says the same Symeon, seeing that they have not been ordained in accordance with the tradition of the Church. In spite of the fact that several anagnosts and sub-deacons are ordained at one and the same liturgy; on the theory that they are more imperfect members of the holy orders, and that they are outside owing to their being in a minor service (commonly called “minor orders” in English), according to the same Job (ibid.). For this reason, that is to say, because of the fact that the unique death of Christ cannot occur a second time, the local synod held in the time of Heraclius against Isidorus in A.D. 613 ordained that two liturgies should not be celebrated on one and the same day and on one and the same table, saying: “It is not lawful on one table in the same day for two liturgies to be said, nor on the same table on which the bishop officiated in a liturgy, for any presbyter to officiate in a liturgy in the same day”: which rule the Papists (i.e., the so-called Roman Catholics) transgress. But then the fact is that even our own priests who celebrate liturgy twice in the same day, under the misconception that this conduces to outspoken emphasis and greater impressiveness, are gravely sinning. Accordingly, let them henceforth cease committing this absurd impropriety." The Rudder, p. 120, note 2. Every bishop who serves a diocese for a significant length of time no doubt finds some occasions in which ordaining two or more priests or two or more deacons would be more convenient than doing two or more separate Liturgies, and yet the fact is that for century after century this Tradition has been of sufficient strength and universality that this has not been done. Even if one were to argue that these saints were simply narrow minded easterners that did not understand the Western traditions, those who would wish to introduce such practices into the life of the Orthodox Church today would need to first seek and obtain the sanction of the Church prior to putting them into practice, and in this case, this was most certainly not done. No clergyman has inherent “magical” powers to perform sacraments. The power comes from their ordination, and their serving with the authority of the Church, and that authority is to do the services in the manner that the Church has authorized them to be done… not as they might personally wish them to be done. To see the decision of the Bishops, click here. Question: "I have heard Roman Catholics argue that Christ taught that remarriage after divorce was adultery, regardless of who is the innocent party, and they quote Church Fathers that seem to agree. They criticize the Orthodox Church’s position on this. How should we respond?" 1. Christ, St. Paul, and the Church clearly teach that the ideal for each person is that they either remain single, or marry only one person for life. Any second or third marriage is considered less than that ideal, even if you are a widow or widower. In fact, you find in the lives of the saints many examples of people who were betrothed to another, and their betrothed died before they were finally married, and yet they chose to remain faithful to their betrothed even after their death, refused to marry any other, and in many cases became monastics instead. So you will find many fathers that encourage people to not enter into a second marriage for any reason. This is why a deacon, priest, or bishop cannot have been married more than once, nor are priest and deacons allowed to marry again, even if their wife passes away. 2. In the Gospels, Christ does say that if someone is divorced for any reason other than infidelity, and they remarry, they commit adultery and cause their former spouse to commit adultery (Matthew 5:31-32). St. Paul adds another reason for divorce – abandonment (1 Corinthians 7:10-15). All of the reasons for the Church granting a divorce with a blessing to remarry are extrapolations from these two exceptions. For example, if a woman has a husband who is a drunk, beats her, and does not support the family, this is considered a form of abandonment. Nevertheless, divorce is always a last option, a bad option (though in some cases the least bad option) and one best avoided if at all possible. 3. Canon 9 of St. Basil the Great states that the innocent party may remarry without any sin on their part or the part of the person that they marry. In our time, divorce is treated as a very light matter, and this is contrary to the tradition of the Church. We should enter into marriage without allowing even the thought of divorce to enter into their mind. However, it is not an unpardonable sin, and with the blessing of the Church, a person may remarry. The irony with Roman Catholics who make these arguments is that they simply call divorce “annulment,” and so in their minds maintain a consistency that they charge us with lacking. I would say that we are honest with it, while they are not. When a couple have been married and have had children together, to call their divorce an annulment, when there was no canonical reason why they should never have been married (such as close kinship) is simply ridiculous. The Orthodox Church is honest, and also pastoral. But we should never forget that God hates divorce (Malachi 2:16), and so should we. You can also listen to a sermon that discusses what the Bible says about divorce by clicking here. Stump the Priest: What Can We Do to Fight for Traditional Values? at the opening of the Battle of Kulikovo (8 September 1380). What are the ways (either derived from doctrine, history, or as guided by current leadership) that ordinary members of the Church--those who need to go to work everyday and may not have a whole lot of extra time to devote--contribute in trying to influence our culture to affirm traditional values and "push back" against those forces that are trying to destroy them? 1). The most important thing for us to do is to begin with ourselves, and to make sure that we are living a pious Christian life, in accordance with the Orthodox Tradition. If we do so, we will influence those around us, and what we say and do otherwise to defend traditional values will carry weight, whereas if we speak out about these values, but do not live them ourselves, everything else we say and do will be a waste of time. 2). Going one step further, we must make sure that our homes reflect traditional Orthodox Christian values. Aside from working on ourselves, ensuring that our children will grow up to be devote Orthodox Christians is the greatest work we can accomplish. 3).We should also work within our parish to make sure that there is one more welcoming spiritual haven for those seeking salvation. A parish has many things that need to be done, and not everyone can do them all, but everyone can do something. We should ask God to show us what our part is, and take it as seriously as we would our secular jobs… in fact we should take it more seriously. a). We can of course pray for our country and for the whole world. This is a very important duty that we all have. b). Since we live in a representative democracy, we can and should vote for candidates that reflect Christian values. We never have perfect choices, but we should pray, and vote for those who come closest to the values that we hold. Among the highest values that we hold are the sanctity of human life and the sanctity of the family. We should not vote for those who favor killing innocent unborn children for the sake of convenience. We should also not vote for those candidates that seek to undermine the traditional definition of marriage, or support other policies that are detrimental to the family. Sometimes weighing these values and looking at the choices we have can be difficult, and of course reasonable Christians can disagree, but let everyone vote their conscience first -- not their pocketbook. c). We can make sure that we are well informed, so that we can talk intelligently with our friends and coworkers about these issues, and hopefully sway them over time. d). Some may be called to run for public office themselves, and there is no reason why a pious Orthodox layman should not pursue so a path, if they feel that this is what God has for them to do. e). You can support groups that defend Tradition values with your time and/or your money. You can also engage in lawful protests. f). And if it should come to the point that the government is either asking us to do things that we cannot in good conscience do, or forbids us from doing things that our conscience requires us to do, we can engage in civil disobedience. I would encourage you to read The Basis of the Social Concept of the Russian Orthodox Church, especially the section on the relationship between Church and State, Christian Ethics and Secular Law, and the section on the Church and Politics. On Wednesday, June 26th, the United States Supreme Court struck down much of the Defense of Marriage Act, and began to lay the ground work for declaring homosexual "marriage" to be a constitutional right. "For the wrath of God is revealed from heaven against all ungodliness and unrighteousness of men, who hold the truth in unrighteousness; because that which may be known of God is manifest in them; for God hath shewed it unto them. For the invisible things of him from the creation of the world are clearly seen, being understood by the things that are made, even his eternal power and Godhead; so that they are without excuse: because that, when they knew God, they glorified him not as God, neither were thankful; but became vain in their imaginations, and their foolish heart was darkened. Professing themselves to be wise, they became fools, and changed the glory of the uncorruptible God into an image made like to corruptible man, and to birds, and fourfooted beasts, and creeping things. Wherefore God also gave them up to uncleanness through the lusts of their own hearts, to dishonour their own bodies between themselves: who changed the truth of God into a lie, and worshipped and served the creature more than the Creator, who is blessed for ever. Amen. For this cause God gave them up unto vile affections: for even their women did change the natural use into that which is against nature: and likewise also the men, leaving the natural use of the woman, burned in their lust one toward another; men with men working that which is unseemly, and receiving in themselves that recompence of their error which was meet." I don't believe this was mere coincidence. This past Sunday, I decided to preach on that passage: Click Here to Listen.